Nasal Polyps: What Are They, and Which Treatments Are Most Effective? If your nose has felt blocked for months, you’re constantly sniffing, or you’ve lost your sense of smell, you could be suffering from nasal polyps—soft tissue swellings in your nose and sinuses. 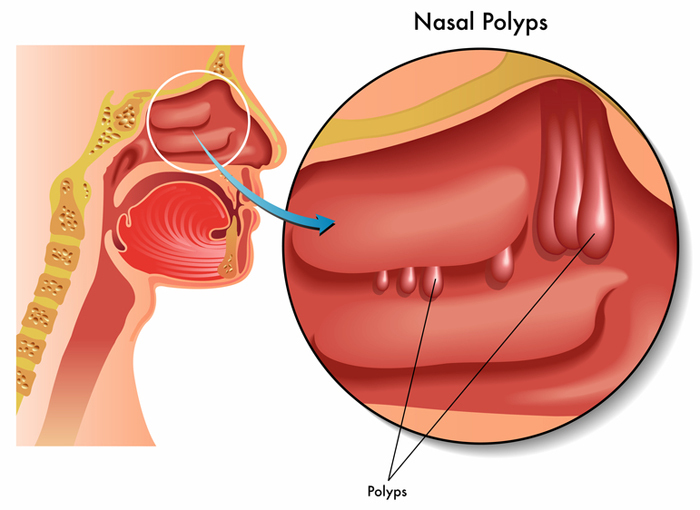 How do you know whether you have nasal polyps? They can affect your breathing and your sleep and cause a persistent runny nose, problems with your sense of smell and/or taste, and headaches, among other symptoms discussed here. Nasal polyps are benign, soft-tissue lesions in the nose or sinuses. These grape-like swellings of the mucous membrane (mucosa) that lines the airways can cause unpleasant nasal symptoms or airway obstruction. Many people are unaware, in the early stages, that they have them. Nasal polyps affect up to 4 percent of adults, and are usually associated with asthma, allergies, and other inflammatory diseases of the airways. Researchers are still looking to understand the full picture of nasal polyps, but they seem to result from an inflammatory process. Sometimes they run in families, and they’re more common in men. Most people who get polyps are over the age of 40. Generalized allergies to various allergens, including pollens (like hay fever), aspirin, and other NSAIDs (non-steroidal anti-inflammatory drugs). Nasal polyps are uncommon in children. When they do occur, the child may need to have a more thorough evaluation to rule out a foreign body in the nose, asthma, allergies, primary ciliary dyskinesia, or cystic fibrosis. How do you know if you have polyps in your nose? With small polyps, the individual may be unaware or have very mild symptoms. As polyps grow or multiply, they can begin to cause unpleasant symptoms. Wheezing and sensitivity to strong odors, chemicals, or dust. Severe allergy to aspirin or yellow dyes. A change in the shape of the nose, due to a large polyp. This may be accompanied by bulging of one eye (proptosis), abnormally large distance between the eyes (hypertelorism), and diplopia (double vision). Endoscopy. If you have some of the symptoms above, tell your doctor so that he or she can do an assessment. An examination of your chest, ears, throat, and nose (with an otoscope). 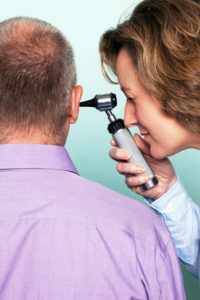 Then the doctor will use an endoscope (nasopharyngoscope), a rigid or flexible tool with a camera or lens, to explore the nose and sinuses and to take a biopsy sample if needed. Biopsy. A biopsy is important to answer the question, “Are nasal polyps cancerous?” In the majority of cases they are benign, but it’s still good to have peace of mind. Imaging. In some cases a CT (computerized tomography) or MRI (magnetic resonance imaging) scan may be needed to determine the extent of sinus or skull involvement. Allergy testing. A RAST blood test (radioallergosorbent test) or allergy skin testing may be warranted, if allergy is suspected. Medical treatment of nasal polyps will vary. Typically, though, treatment begins with a nasal corticosteroid spray; some people may need a short course of oral steroids, such as prednisolone. Very rarely—in cases of in severe airway obstruction, for example—intravenous or subcutaneous (under skin) steroid injections are needed. If the underlying condition is known, it should be treated, or the polyps may return. Examples of nasal steroids include fluticasone (Flonase), mometasone (Nasonex), budesonide (Rhinocort), flunisolide, and triamcinolone (Nasacort). As for which nasal spray is best for nasal polyps, that comes down to trial and error and personal preference. Another possible option: nasal polyps removal. When polyps are large or don’t respond to steroids, surgery may be necessary. Usually, it’s done on an outpatient basis using a thin endoscope; a hospital stay isn’t typically required. Surgery tends to be less effective in people with asthma or aspirin sensitivity. As for children with multiple benign nasal polyps, if medical treatment fails, surgery may provide temporary relief, but the recurrence rate is high. More extensive surgery to remove more of the mucous membrane has a higher success rate, but an increased risk of complications. allergies, allergy, allergy testing, anti inflammatory, anti inflammatory drugs, apnea, asthma, children, ears, hay fever, nasal allergies, nasal polyps, nasal spray, non steroidal anti inflammatory drugs, nose bleeds, nsaids, pain, polyps in your nose, sinus, sinus infections, sinusitis, skin, sleep, sleep apnea, stuffy nose, wheezing. I thought you might be interested in this article on https://universityhealthnews.com: Nasal Polyps: What Are They, and Which Treatments Are Most Effective?